The research team at the Department of Electrical and Electronic Information Engineering, Toyohashi University of Technology has reported that adding water into an electrolyte improves the function of vanadium oxide, a positive electrode material in calcium-ion batteries. Although water in electrolytes is known to produce many negative effects, it has now been found to induce a phenomenon that speeds up the conventionally slow reaction of calcium-ion batteries. The results indicate that this phenomenon is caused by changes in the electrolyte structure. The researchers believe that this discovery will greatly benefit the development of electrolytes for implementing calcium-ion batteries in the future. Secondary batteries are valuable resources that support various industries. Today, secondary batteries are required for reusable energy and electric vehicles. Lithium-ion secondary batteries are already widely used as powerful secondary batteries. However, in recent years, the safety of secondary batteries has been questioned, with countless reports citing combustion. The need for secondary batteries is expected to increase exponentially along with the rise in electric vehicles. This means a higher demand for lithium, and in turn, problems such as higher prices and potential resource depletion. Calcium-ion batteries are a type of next-generation secondary battery that does not use lithium and can achieve a battery voltage that rivals that of lithium-ion batteries. Compared to lithium-ion batteries, calcium-ion batteries are safer, cheaper to produce and their resources are much more plentiful. However, calcium-ion batteries are still subject to a number of issues. One such issue is that they operate at a speed much lower than that of lithium-ion batteries. Adding water causes the organic solvent around the calcium ion to decrease and water to increase. Water also causes an important structural change in that the negative ion separates from the calcium ion. Credit: Toyohashi University Of Technology. In this study, Toyohashi University reported that the slow operating speed of calcium-ion batteries could be improved by adding water into the electrolyte. The graphs of the test results show that overvoltage that occurs during charge/discharge greatly decreases as the amount of added water increases, and that reaction proceeds without any problems. The researchers proved that this phenomenon is caused by the fact that the structure of the electrolyte is greatly changed by the addition of water. 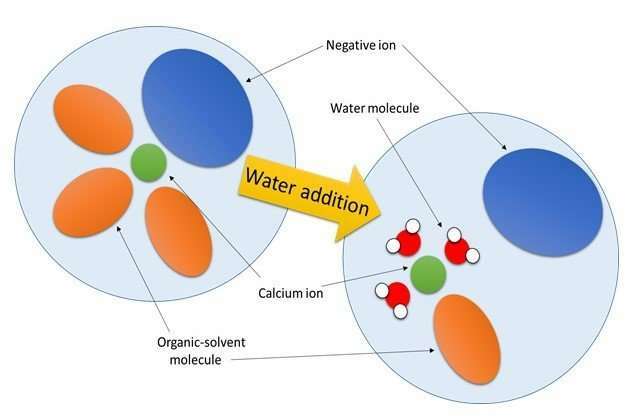 Yoshiaki Murata, Ph.D. student and first author of the study, says, "The electrolyte is made up of positive ions (calcium ions), negative ions and solvent molecules, and the state around the calcium ion greatly changes when water is added. What that means is that, in order to improve the performance of a calcium-ion battery, preferably no negative ion is attached to the calcium ion in the electrolyte and a solvent molecule that easily separates is attached to the calcium ion. While we still need to discover an electrolyte with these characteristics that does not include water in order to achieve calcium-ion batteries, the discovery of this phenomenon will surely help with future electrolyte development." The result of the present study was actually a secondary result obtained while studying new electrolytes. Electrolytes need to be sufficiently dehydrated when they are developed, but this dehydration process is difficult. The present study was conducted due to the characteristics of a battery improving while testing an insufficiently-dehydrated electrolyte. Although there are reports on a phenomenon in which the performance of such as a magnesium-ion battery improves due to the addition of water, the mechanism behind this was not clearly known. It was surprising that the same phenomenon could be seen in calcium-ion batteries, and we believe that elucidating the mechanism behind this behavior would prove useful for the future development of electrolytes. Our research team is looking to develop and assess new electrolytes based on this newly discovered electrolyte structure that improves the performance of calcium-ion batteries. Further, we have not been the only ones to study this; there has been rapid increase in the number of studies on calcium-ion batteries in recent years. Ultimately, we would like to develop a calcium-ion battery that has the capability to rival or overtake lithium-ion batteries.